I’m an ENFP on the Myers Briggs Type Indicator (MBTI). Always have been (meaning: same result each of the dozen times I’ve taken the thing). Probably always will be. And so afterward, I to myself: that explains why I was never able to start the paper three weeks in advance, read two books and three magazine articles, keep the notes neatly organized on notecards, and finish the first draft the week before. That explains why I’m up all night in a flurry of excited creativity, photocopies strewn about and highlighter stains on my fingers, until the thoughts flow like water through a dry irrigation channel. Inspiration. Not perspiration. I’m an ENFP, by God! It’s who I am! I think this section of Purgatorio (meaning, Cantos 2-6; meaning Ante-purgatory) is ideal for ENFP’s. 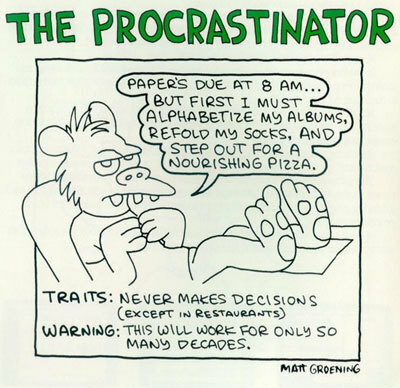 Meaning…procrastinators. And oh, I am not implying that we’ll all end up here – but there’s perhaps a better chance than most that this is our crib, initially, in heaven. Dante’s playing around here, it seems to me, with this question: how do we get there? Is it by perspiration? Or by inspiration? Before I too hastily say that we ENFP’s have the right answer (inspiration), let me say that I’m sure Dante (being the extremes-avoiding, died-in-the-wool Aristotelian that he is…especially in this Canto) would say it’s got to be both. But before we go there, first of all, let’s consider this: where is the “there” we’re trying to get to? It’s clear that what Dante’s after is the ultimate there: symbolically, it’s the thing that is represented by an entire 1/3 of the poem: Paradiso. It is the thing most to be desired, the ultimate joy and fulfillment of the human soul. It is that the place governed by that love that scratches our ultimate itch: a love that is love-in-loving. Whether we realize it or not, this is the ultimate thing that ought to capture our attention and desire, and it’s what we human beings are built for. Hell is where it gets totally screwed up beyond repair, and we forget the assignment itself; and purgatory’s where we work it out. We get the ultimate extension: all the time you need. This whole section of Purgatorio is about those who, for one reason or another, were too preoccupied until the very end to apply their attention to what matters most: the disciplined practice of love that gets you there. The steady work that puts you there in your present, in-spired (that is, breath-ful) life, because you’ve gotten a taste of it, and it’s sweet. Here, we see the shades of those who put it off to the end for seemingly good reason: the rulers mentioned here are “types” for all who neglected their own soul to be in service to others, through their exercise of worldly duties. I’m sure there are a lot of dutiful moms, magistrats…minsters here too? Their reward is a resting place of technicolor beauty (reminded me of that psychedelic Pink Floyd poster I stared at so many hours under a blacklight when I was a kid). One wonders, though – and this is a total riff – if God isn’t giving them a foretaste of the truest distraction that should have preoccupied them: might the beautiful colors represent that vivid brightness that should serve as the ultimate attention grabber. These are the colors of heaven, the brightness of the divine. Which brings me back to the main point. How do you get there? The sun, in Dante’s cosmos, plays a very clear and specific role: it is the inspiration part. It is the divine illumination without which one cannot make any progress toward the top of the mountain, toward that-which-matters-most. This seems particularly resonant right now, and not necessarily in a good way. There are so many I know who are feeling like they are in the dark. Completely unable to lift a toe upward, completely unable to make any progress forward; and it is no fun, let me tell you. And I know, because I’ve been there myself. Dark night of the soul. Theology seems like nursery rhyme. Life makes no sense. It’s night. We’ll just have to rest the night, and wait until morning. I can testify to the notion that the color is indeed brightest when you’ve fully explored the darkness of night. That’s how it works. And – again having been there myself – I can tell you that morning does come. After night. How do you get up the mountain? Is it inspiration? Is it perspiration? Presbyterians (so firmly on the inspiration side of the equation) do well to note: it’s got to be both. A holy and wise understanding of both in their place. Evidence of Dante’s astute Aristotelian mean-ing: just take a gander at Henry III, practically the last visage we see in this Canto. The guy is there for the opposite reason: neglecting his worldly duties for an obsessive preoccupation with piety. Too fascinated by the notes and the drafts to ever actually produce anything at all. How do you get up the mountain? Here’s an even better answer, and another reason we’re not in hell: It’s not just inspiration. Nor perspiration. It’s with others. The help of the other, others; the Other.